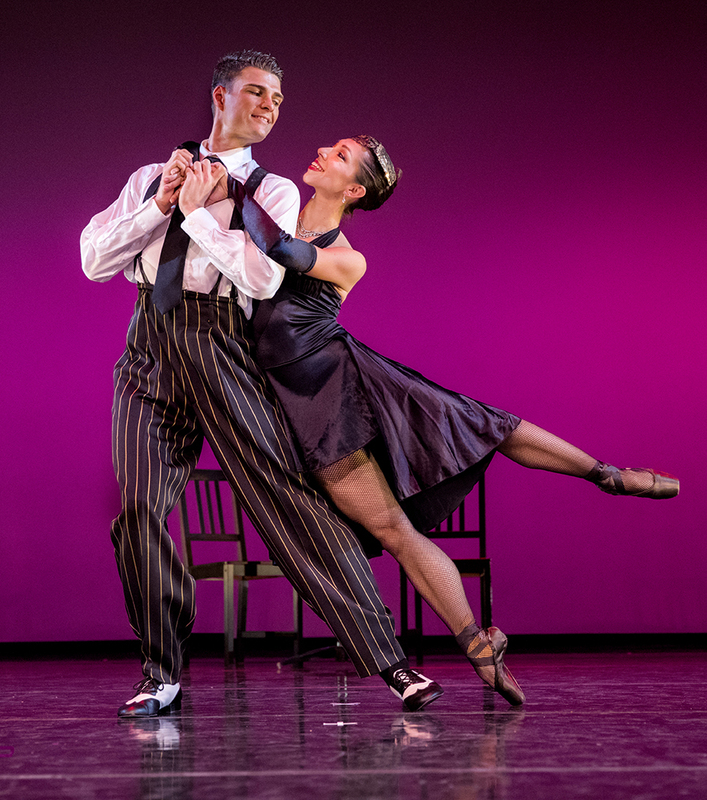 It simply wouldn’t be the holidays – or at least wouldn’t feel like the holidays – if Diablo Ballet didn’t open its season with the perennial favorite, A Swingin’ Holiday. Having performed this very popular, high energy, holiday favorite annually since 2012, the opening of our landmark 25th Season will kick off this festive time of year in the same way. But if you’ve enjoyed A Swingin’ Holiday before, don’t let the name fool you and lull you into thinking you’re going to be seeing a repeat; it’s never the same show twice. Originally created by Broadway choreographer Sean Kelly, he has returned every year to change things up a bit. It may be some of the music that’s different, or new dancers bringing a different vibe, or substituting one segment for another. Sometimes it’s simply fine-tuning some of the choreography. 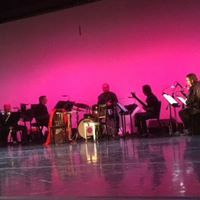 This year, Kelly has created a new pas de deux as well as a new solo; two new upbeat songs from the Big Band era will be performed by the live 16-piece Diablo Ballet Swing Orchestra. Choreographer Sean Kelly works with dancer Jordan Tilton. Kelly is certainly no stranger to the world of dance. Growing up in Marin, he initially started dancing in a studio that taught all styles, including jazz, modern, Latin American, ballroom and ballet. Then he switched to Marin Ballet, where he began focusing primarily on classical dance – and met Lauren Jonas, Diablo Ballet’s co-founder and Artistic Director. In a 2012 interview, Kelly stated his belief that the variety of his early training helped him be open to different dance styles and techniques – something that has served him extremely well over the years. Moving up the ranks from dancer to ballet master had its challenges, Kelly said, admitting in an earlier interview “I wasn’t always comfortable supervising dancers who had previously been colleagues.” He also found himself becoming more interested in doing musical theater and thought this was the right time to explore other avenues. He had friends that had made the switch to musical theater and they helped him get to New York and begin the next phase of his dancing career. Getting into a regional production of Carousel led him to his first touring production as both dancer and dance captain in Swing, a Tony-nominated play celebrating the music of the swing era of jazz. “I learned a lot from this show,” Kelly remembered. “There were so many different dance styles, including the Lindy Hop and West Coast Swing,” he said, styles he incorporated years later when choreographing A Swingin’ Holiday. FOUR LAST SONGS. Dancers: Christopher Veljovic, Rachel Beard and Sean Kelly. Photo: Geoff Winningham. Kelly did Swing for several years, serving as both a dancer and dance captain “which was really amazing,” he said. From there, he joined the touring company of Twyla Tharp’s Movin’ Out, featuring the music of Billy Joel. Again, Kelly was both a dancer and dance captain in this Tony nominated show, which “was more down my alley, it was a really good fit for me,” he said. He eventually was named Resident Director. Next came Billy Elliott, the Tony Award-winning show featuring music by Elton John. Kelly was resident choreographer for the touring company, coaching the young (11-14 year old) boys and making sure they were safe. “It was quite a responsibility,” Kelly remembered, “Intense but really special.” Just recently, he completed a two-year stint as Associate Choreographer/Resident Director for the national tour of An American in Paris, another Tony-winning show. Along the way, Kelly freelanced for different companies, including Diablo Ballet. One day, Lauren, his long-time friend, who is always looking for new and innovative repertoires for the Company, approached Kelly and Diablo Ballet’s Music Director, Greg Sudmeier, with an idea: Let’s create an annual holiday piece together, incorporating well-known holiday songs, big band music (a passion of Sudmeier’s, who’s writing and arranging is showcased) and a variety of dance styles. I said “I thought that would be amazing,” Kelly noted. And from there, A Swingin’ Holiday was born. The three creative minds had meetings, selected the music, created the base of a show and then Kelly crafted the storyline of couples at a holiday party in a club back in the 1930s or 40s. “We needed to keep it family-friendly so there are some playful, silly ideas but we also wanted it to be athletic and exciting so it would appeal to a variety of audiences,” he said. So sit back, enjoy the exhilarating music, the fabulous dancing and let the holiday season begin.